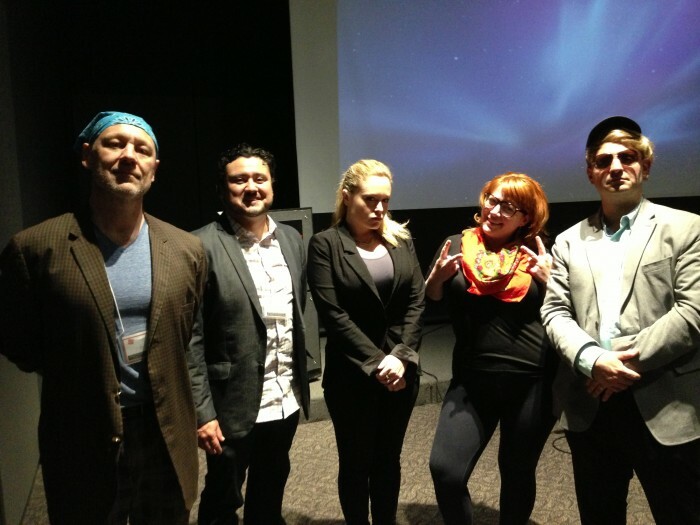 Ask Leo was performed as the keynote lecture of the Gretchel Hupfel Symposium of the Delaware Center for Contemporary Arts in Wilmington, billed originally as “The Iconoclasts Arguments: A Byzantine Discussion”, on May 10th, 2014, including John Muse, Joseph Gonzalez, Maiza Hixson and Pablo Helguera in disguise as an audience member. 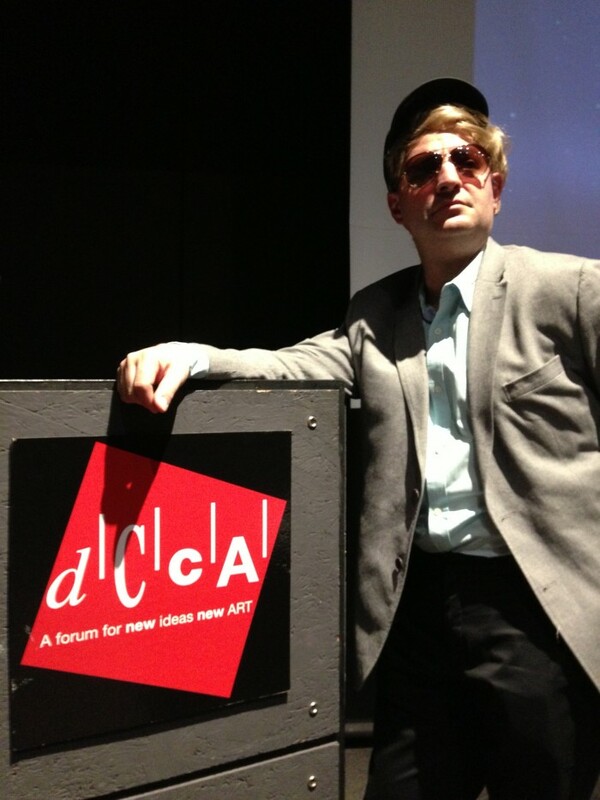 Welcome to DCCA and to the 2014 Gretchen Hupfel Symposium titled ART: A Creative Debate. My name is Maiza Hixson and I am delighted to bring a group of exceptional scholars to discuss some of the most pressing issues in contemporary art today. The subject that we decided to approach this year has to do with what we believe has become a central point of contention around new kinds of art making that cannot be supported by the existing infrastructures of the art world. Art that cannot be commodified, sold, collected or owned in any way is nothing new. But these days, the art world faces a particular period of clash of practices. As we know, the production of art is excessive and appears to be in overdrive with the creation of millions of new art works a year and a multi-billion dollar industry of objects that museums and collectors all over the world fight to obtain. After several decades of this growth, and despite the large crowds at art fairs, biennials and museums, there is a belief amongst many that the art world is increasingly out of touch with the outside world. As part of this sentiment, a growing group of artists over the years have taken strong positions against the massive global process of commodification of art and the current economy of art as it is — a reaction that has included the emergence of socially engaged art and other types of political art practices. The question we want to ask tonight is: are we in the presence of a new revolution in art? Thank you and please join me in welcoming them. Thank you Maiza. I am very pleased to be here with you tonight. The question for the debate tonight, as Maiza mentioned is: are we amidst a new revolution in art making? And, is there a fundamental change taking place or not? My position here is that we are indeed living a revolutionary moment that will change the way, not only the way we exhibit art, but the way we think about art, period. We all are familiar with the arch of modernism, whose end we have simply try to extend in a long and prolonged death for many decades. Probably there will be many decades more where artists will continue making art that refers to that history, in the same way that there are many artists who continue making academic painting today. But the fact is that we are seeing another mode of art making, one that doesn’t depend on museums, or in the gallery scene. Young artist make blogs, ephemeral videos and objects that transform over time, that are not permanent, material or stable. Others have merged their life and their work so intricately that they don’t bother making a distinction between what they consider living and art making. Socially engaged art has grown exponentially over the last five years and we have seen with it, a remarkable community of artists that are taking a political stance that directly challenges the status quo. So, in many ways, yes, I do think that this is a unique phenomenon that had not been seen before, and what is bringing to us is both unexpected and exciting. Thank you so much for having me here. My position in this discussion is that this so-called revolution or shift in art making, while I concede its interesting, I would not rush to declare it a seismic movement that may change things in a fundamental sense. For that you first need to consider that, every few years, revolutions in art are routinely declared; we just don’t have the perspective sometimes to see the dimension of changes from the present, which is usually pretty small. In this sense, there has always been political art, or art with a social content. So a shift of social and political consciousness is not unusual, but rather the reaffirmation of the rule. Secondly, there is a very established cycle of countercultural movements that eventually get absorbed into mainstream culture. This means that talented new artists, usually from younger generations, often enter into the scene presenting ideas that may rebel against the status quo, and at first are ignored. At some point they do become accepted and absorbed by the mainstream, and at that point they themselves become mainstream. Look at performance art. It emerged as a radical practice that rebelled against the institution, and now it has been entirely domesticated. You can sell and collect and preserve performance in the same way that you can sell and collect and preserve a painting. So I think that what we are looking at now is nothing other than another wave of what has been a pretty slow but still continuum of ideas that came from modernism. I would like to question your comparison between culture and counterculture and what is happening in art right now. Basically, when you look at the vast majority of postwar art and art up to and including the 90s, most of it is dependent of the gallery space and the museum to exist. That is no longer the case. What do you mean? We are dependent of this institution to have this conversation, aren’t we? But we don’t necessarily have to be here to have this conversation. We could have it at the bar next door. The frame of art is no longer institutional, but the institution is now simply discursive. Its what you and I decide what art is and then discuss it. Hold on, let me finish the thought. Because the new frame of art is just discursive, and actually barely, the museum is increasingly useless to host that kind of art. Its fulfilling its original mission of being a mausoleum. But have you been inside a large museum recently? Places like the Tate, MoMA, the MET, the Pompidou. Hundreds of thousands, millions of people visit. People are in awe at what they see. These don’t feel like mausoleums to me. I think we too quickly keep thinking of the art of the past as dead art. It is never dead to me. Its like what Faulkner said, the past is not dead, its not even past. Don’t get me wrong; I recognize the role that museums play today. But the large museum, even if it tries to fulfill an important mission in serving the large public, that makes it very clumsy when it tries to explore the cutting edge of art. It is not surprising that people associate museums with churches where you come to pay your respects to your favorite saint. Or like libraries where you just go see past references. Or tourist destinations, where people mainly go to take pictures of themselves and the art just to say they were there. But these places increasingly are out of touch with our present debates and problems. You can say it is present only because it is here in front of you right now and whatever you are feeling about that art work you are feeling it in the present, but then everything should be present. If I look at a million year old fossil then that should also be considered contemporary just because its here? I think you are drawing the wrong conclusions from simply looking at cultural tourism, which of course exists, but museums play a much more important role: they are the natural necessity of visual culture. But the problem is that most art is not visual anymore. Most art is not visual? Maybe that art that you are referring to is not visual art after all. Maybe its something else, like activism, or social work. No, I am serious. I mean, don’t you think it is ridiculous when you try to treat reproductions of say, a happening as if it was the reproduction of a painting? Museums do that ALL the time, only confusing the audience. That may be more of a problem with the work, not with the museum. There’s a saying: you can dress the monkey in silk, but the monkey remains. If the work is not visually compelling I don’t see how that can be a strength. Are you kidding? but that goes back all the way to Duchamp! He is the one who said he was against “retinal” art. Duchamp is different. He conceived his artworks always to be inside galleries. What I don’t understand is why we need to forcibly put art works that don’t belong to the narrative of the history of art into a museum if they don’t really have anything to do with it. Well, I think you are really wrong there, Joseph. The mismatch is not that these new art works don’t care or can’t fit into a museum, its that we have a whole industry of exhibition venues modeled after XXth century ideas, when the art that is being made right now is XXIst century. It is that museums haven’t evolved. But then what you are proposing is, essentially, the eradication of art. Am I? Wow. How’s that? You are arguing for museums to stop being places for visual culture. I don’t know what that even means. What the hell is visual culture? The history of art is the history of visual arts. If you are making activism as art, that doesn’t belong in a museum, maybe in the museum of activism. Which by the way, I doubt many people would be interested in visiting. On the contrary, the modern museum doesn’t belong to our day. You can keep the XXth century museums, but those should be left alone to hold the art of the past and we need to build spaces for the present and future. Ok, John, that’s enough. I just find that this whole anti- museum talk just is hollow and unproductive. The problem with art may not be that there are no places to support it or show it— its that it is poorly conceived. That is the same argument that the French academy used when the Impressionists came around. Ok— I feel I should intervene briefly here. It seems to me that the debate that we are having right now has to do with the visual dimension of art, and how we should think about framing art that does not rely too much or primarily on the visual. Let me follow up with a question then. At what point does visual art stop being visual art, and does it matter? Frankly I don’t think this is such a difficult question. Visual art stops being visual as soon as it doesn’t rely on visuality to make a statement. Then it becomes something else. I think this is what confuses a lot of people. I couldn’t disagree more. This is like saying that performance art is like bad theater, which is a total misunderstanding about what performance is. I am not sure I follow… how does performance come into the conversation? Performance art came from visual arts- it did not come from theater. In the same way artists who do social practice they came from the visual arts, so their gestures, their acts are in dialogue with that history. They need to be understood in terms of that history. So, yes, it absolutely matters how you call it. But John — I grant you that this stuff may come from that history, but just because something has emerged from a certain tradition it doesn’t mean that it should remain forever an extension of that tradition or abide by the rules of that tradition…for example…. I mean, many artists today who make work outside of museums, outside of the visual tradition of art, outside of object making, have renounced practically to every single aspect of what we understand as art making. Some of them don’t seem to even care if what they do is called art. So why should a museum for example try to support or present to the public that kind of work that has clearly detached from every premise connected to the visual arts? Joseph, that is exactly the point — that this rebellion in art is happening with the objective to rethink the role of art in our lives and to reform the institutions of art. Over decades now artists have tried to erase the boundaries between art and life because they want art to be relevant to life, not to be an isolated thing that is not part of the world we live in. It appears we already have a question. We were going to take questions at the end, but is it ok for either of you that we take a question now? Thanks for the discussion- its interesting, but I wish you all would get to the main point. I guess I am just curious about what either of you understands as the concept itself of art. I mean, do either of you think that art is a religion? What? No. You mean art as religion? No. Well, I wouldn’t say no exactly. its more complicated than that. You seriously think art is a religion? Maybe can we discuss art in terms of spirituality? Art is not a religion—it is art. But Joseph, hold on before you bring up Malevich. You just were saying that the fact that socially engaged art comes from art history is irrelevant. Why would now the history of religion be relevant for contemporary art? But you were the one comparing museums to churches a minute ago! One just can’t understand how and why we value artists if we don’t understand how religion has determined how we give spiritual power to objects. But I was bringing it up to say how that is wrong! Museums should not be churches and art should not be a religion. I don’t have anything against religion..
John, I think you are just against art. Me? If you think art and religion are the same thing, you are against both art and religion. So both of you are against religion? No, they didn’t say that. maybe they are both against art. I am against stuff that calls itself something and it is not what it says it is. Maybe that’s where the problem lies. What do you mean “that’s where the problem lies”? You can’t go around policing the world with your own definitions. If someone says something is art it is art, period. So if I say that this discussion is art, it is art? What if you say that it is religion? Well, that is the real difference, right? Nobody goes around pointing at stuff and deciding this pen here is God, or that chair is God. Unless you are mentally deranged. And yet that is what artists have been doing now for a century. Its called “found object”. 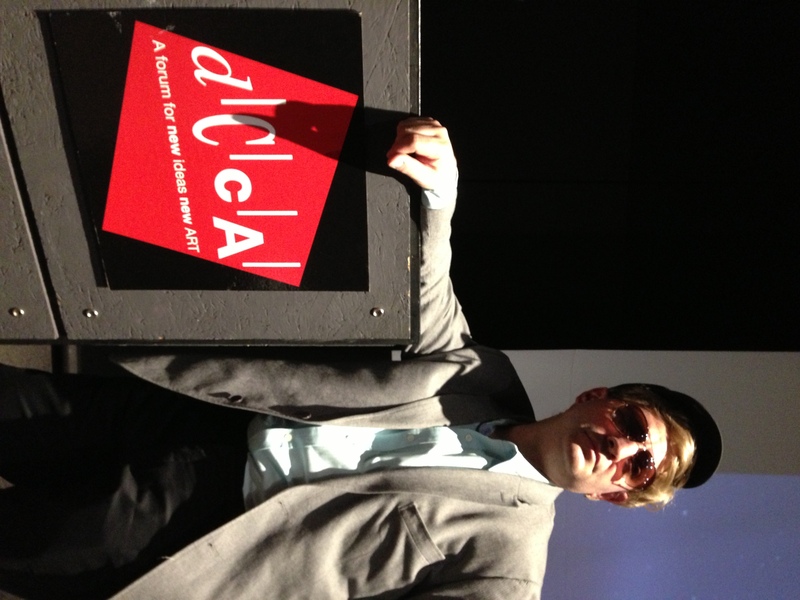 We go back to Duchamp…. Excuse me… excuse me. I feel we are going in circles in this discussion. And I am disappointed that we have been all sitting here, listening to your arguments that don’t seem to lead anywhere. Is this a symposium? I agree that we need to focus more on this discussion. Like, this whole discussion about who gets to call something art.. isn’t it now irrelevant? I mean anything can be art and anyone can be an artist. The point is, is any given art work relevant and what makes it relevant? Thank you. That is what I was trying to say. But why didn’t you say it? I was trying but everyone else was talking! I feel we are off track again. Ok, but let’s just move please from the religious discussion. But that’s part of my question. I guess its not a question but a statement. No more statements. Lets just stick to questions. I think its ok- lets hear. Thank you. Let me see- I took some notes [looking at some notes]. This discussion was billed originally as a discussion on the iconoclast arguments, which is why I came. I am interested in that subject, as I studied it very closely in college. Me too. That’s also why I came. I would never come otherwise. I hate art discussions because they don’t lead anywhere. So let me provide some context for the audience. So, in the 8th century Emperor Leo III forbid the depiction of Christ in churches and temples and ordered all the images removed. This caused a huge pushback that lasted for a whole century. There were the iconoclasts, who were in favor of destroying all depictions of Christ, which is a prohibition by the way that comes from the old testament. This reminds me a bit of Occupy Museums. Were they proposing to destroy art inside museums? The point is that this was a very divisive debate that created a huge crisis in the church. Why did Emperor Leo suddenly become so invested in this idea of destroying images? Nobody knows. I mean, nobody knows for sure. There is the idea of going back to the fundaments of the Old Testament as I said, but there may have been a political reason too. I mean, just think about it: the tensions at the time between Christians, Jews and Muslims, who forbid images as well. So to forbid images could have been a way to create harmony between religions. But maybe also take power away from the churches, which had accumulated so much power at the time as sites of adoration. So what’s the larger point?… I mean, how does this connect….? You tell me. You are the lecturer. You are the one who brought up the question. You said no statements. I asked a question, you answer it. I don’t know the answer, but I do think there is a point here. I agree. Do you agree? See, this why I asked about art and religion. instead of forbidding depictions we are forbidding non-depictions. I try to be the voice of reason- I am not the one trying to destroy museums. Maybe only getting rid of the art inside then. Making museums non-visual? We forbid art that is not image-based. Well, not exactly. Forbid is a strong word. You could say though that those who are most attached to the traditional values of XXth century art forbid letting art ascend to the hierarchy of divinity that image-based art has had, that those sacred paintings on the wall have. What’s at stake today is the replacement of that hierarchy by other forms of art that don’t rely on the worshipping of the object nor on the status that it acquires by entering into the sacred realm of the site that bestows that sacred value. So in a way one can argue that Leo’s prohibition of icons mirrors, in an inverse way, museum’s disregard for art that does not result in collectible, material and visual products. I don’t agree. That’s such a gross generalization. That’s like passé Marxist theory. [ to John] Thank you. Finally. Ok, whatever. But let’s think about this then. If history is a guide, Leo III lost in the end. People continued worshipping icons in spite of his empire and his army. What does that tell us? That we shouldn’t follow history, as you suggested earlier? That we are just wired to worship things? Or that we can’t stop the course of history. Or that both history and religion are poor means to understand art. Or that nothing ever changes. Desecration leads to worshipping and viceversa. maybe that forbidding non-visual art will lead to its worshipping. maybe what all this means is that this is a never ending debate. it only has taken several centuries. One shouldn’t expect less of art. maybe we should stop here. If history is any guide. When in fact there aren’t any guides.